“Many successful countries who have achieved Universal Health Coverage (UHC) have been driven by ethical concerns. 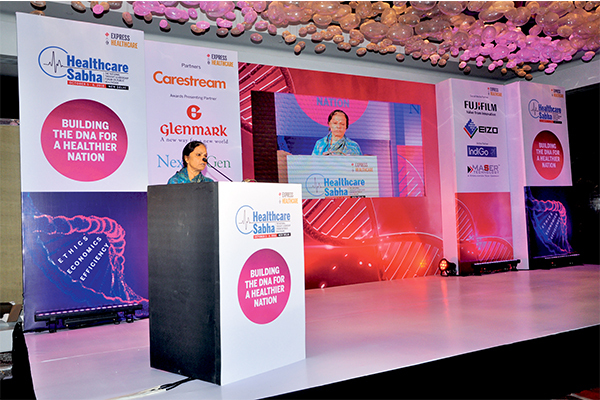 So ethical dilemmas and its emerging challenges needs to be addressed,” said Sujata Rao, Former Health Secretary, Ministry of Health & Family Welfare, Government of India at the 4th edition of the Healthcare Sabha. As the keynote speaker on the second day of the event, Rao addressed the august audience of public healthcare leaders and pointed out on the various ethical issues and emerging challenges faced by the India healthcare sector. “Many countries like Brazil, South Africa, Turkey, Thailand, Malaysia, Vietnam and China have achieved UHC or they are in the advanced stage of achieving UHC. For example; in Turkey and Thailand, 80 per cent of healthcare services are provided in the public sector, largely to keep the cost of care low and also to keep up the quality of care on par with the private sector. India inherited such an ethical basis at the time of independence yet we are on par with the African countries on our journey towards realising UHC due to various reasons viz. lack of healthcare budgets, corporate sector monopoly among others,” Rao said. Discussing various ethical dilemmas that the current healthcare sector is facing, Rao also listed out few basic challenges in the health sector.